Let’s finish up the last few remaining items in The Power Of Force “2” [FlashBack/CommTech] toy line. The STAP With Battle Droid is an Episode I Sneak Preview release. It was a big hit. Learn more in our Research Droids Reviews today! Be sure to leave your thoughts in our comments section, vote in the poll, or comment about it on our Facebook page. Click the banner below for the direct link to the review! As always, you can also send your review requests via email if you’d like to see something that we didn’t cover yet. 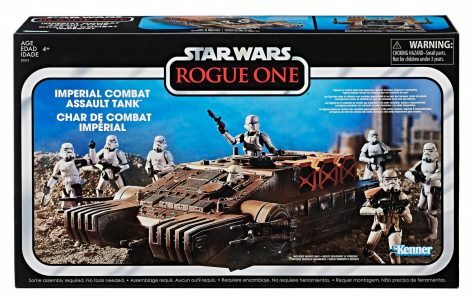 Hasbro has put the Imperial Combat Assault Tank on their eBay store for $79.99, with limited quantities available, AND free shipping. Thanks to JTA reader Martin for the alert!